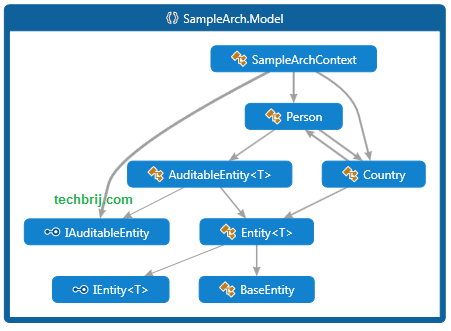 In this post, we will see how to implement a decoupled, unit-testable, N tier architecture based on Generic Repository Pattern with Entity Framework, IoC Container and Dependency Injection in ASP.NET MVC. We will implement a sample application step by step for the same. 1. Keep a clean separation of concerns. 3. A complete example on Repository and Unit of Work with IoC and Unit Testing. Repository Pattern: To create an abstract data access layer for the application which allows to centralise all data access logic in one place. With generic feature, we can reduce the amount of code we need for common scenarios. Unit of Work pattern: To combine a set of interactions and commit them at once using a transaction. The Repository Pattern on MSDN. 1. Open Visual Studio, Create new “ASP.NET MVC 5 Empty Project” Say “SampleArch“. Remove Class1.cs which is created by default. Remove UnitTest1.cs which is created by default. ScaffoldColumn(false) is used So that ASP.NET MVC Scaffolding will NOT generate controls for this in Views. We will handle these properties in context SaveChanges method. Here we are setting audit column values by overriding SaveChanges method. 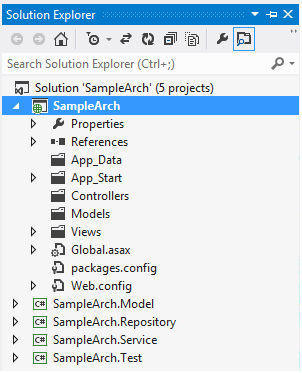 Now in web.config of asp.net MVC “SampleArch” project, add connectionstring named “SampleArchContext”. In “SampleArch.Repository” project, Build and Add reference of “SampleArch.Model” project. Note: I didn’t use IQueryable for public methods because EF queries should NOT be made outside of repository layer. Here we did override GetAll method to include country. /// Initializes a new instance of the UnitOfWork class. /// Disposes all external resources. This is common implementation for the services. Lets create Service classes for Country and Person. 1. Constructor of service layer takes UnitOfWork and Repository objects. 2. Service layer can’t access databasecontext object means LINQ query on top of entity framework can’t be applied here which makes clean separation of concern. In next part, we will setup Autofac and Implement CRUD operations in MVC project using these layers. You can get source code in last part of the series. Perfect, this is what I’ve been searching for a decade. With this handful examples I think I have learned enough to get started. Thanks. what is the responsibility of IPersonRepository and IPersonService ? are they doing same work? Generally Repository is related to do CRUD operations of Model while service is to implement business rules/logics. It might include multiple repositories. What is the purpose of the unit of work? It seem useless if my controller/application is not using it. I could simply put the save/commit function in my generic repository. For example, I would say that you have an issue if you want to reuse the same Unit of Work on multiple transactions with this approach. But perhaps a small tweak can solve this problem. Sorry but it’s not a good article, you have a good idea, but you have a problem, UoW it’s for supports transacctions. can i use web api 2 instead mvc web layer with autofac modules? I am really interested in how you setup your model layer, but have a question. I am a bit confused to why there is an Entity and BaseEntity. I understand that this is the lowest level so anything that all entities will have in common will go here, but why do we need both Entity and BaseEntity and can you give me an example of what kind of items would be put in the empty BaseEntity class? It just seems a bit overkill to have both. 1) Do you have a smaple code project for download? 2) What is the purpose of IService? I can’t see why you would need that interface unless you want to extend but you are already doing that with ICountryService etc? A very good article. One question I have. 2. Pass the UnitOfWork to repositories so that they can support transactions(which is essentially 95% same approach as this class). I can see the benefit of servicelayer that it can abstract out the DbContext and application layer further but while creating the service layer, we anyways have to pass the Repository class which would expect me to pass a DbContext in its constructor. So the application actually knows about the DbContext too. imagine that when I add a person, in the same transaction update another different table. As you would?? Hi I liked this Architecture it’s actually very clean, but I don’t understand why the IQueryable shouldn’t be used outside of repository. I would like to implement one Architecture like this but using filters on list (Index) and pagination, and the filter I used to do with IQueryable, any suggestion to implement something like that? Making an abstraction over an abstraction is quite overkill, for me a dbcontext like your example is already an unit of work, so why bother encapsulate it again. By all means previously i used repository approach, somehow i found it can quite become messy especially when you are dealing with multiple repository and doing interaction between them. I found this, http://rob.conery.io/2014/03/04/repositories-and-unitofwork-are-not-a-good-idea/, approach has much more cleaner way by using CQRS. You put the Context in your model project. But this is the domain of your application and so it should know nothing about EF or context. The context should be in your repository project since it is responsible to work with EF. Why did you add EF to the model domain and how to refactor in order to autofac see it in the right place (repository) ? Please make a video Tutorial. If you have already one pls share the link. Hi, how would you handle an update on two entities in the same unit of work? Thanks in advance. Another thing i noticed we may need use ModelState on Service for business logic validations. So is there a way to inject that with Autofac too? Very good example to get started! On this behaviour what should we doo if need a service inside another service? I think instead of using service we can use Repository for CRUD operations. Please correct me if I am wrong. It depends…Testing on a generic repository is easier, and decouples the dependency on Entity Framework. Yes, I’m in a greenfield project and plan to ditch this pattern. It’s a nightmare of abstraction upon abstraction upon abstraction. Abstraction to a certain extent is good, beyond this extent is pure madness. I like clean and simple and a good read for someone who’s an aspiring solutions architect such as me. This is Great Stuff. I will help me.